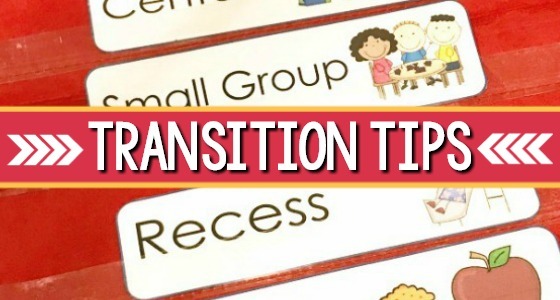 It can be so overwhelming to plan for the entire year of preschool! 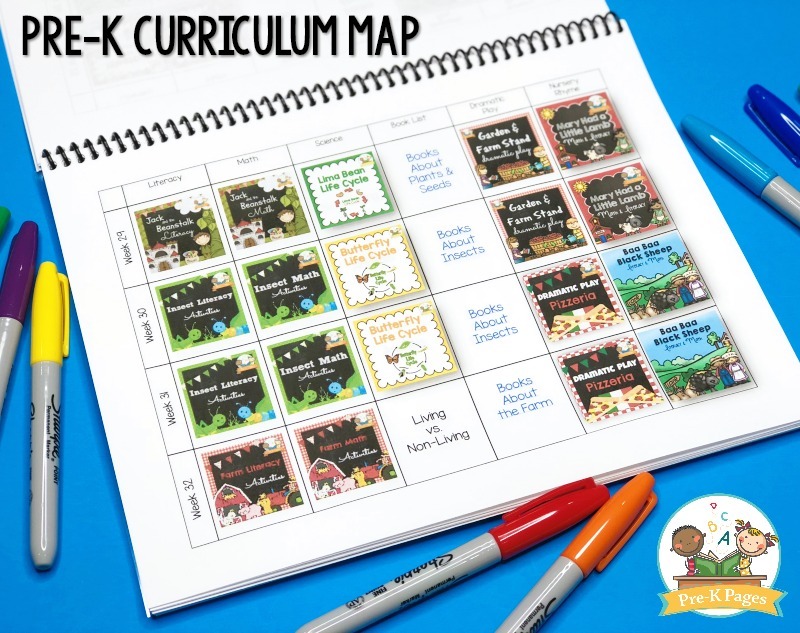 That’s why I created this year-long curriculum map for preschool and Pre-K, it includes a Year at a Glance, weekly small group math and literacy plans, book lists and more. I’ve mapped out the whole year for you, just print and go! 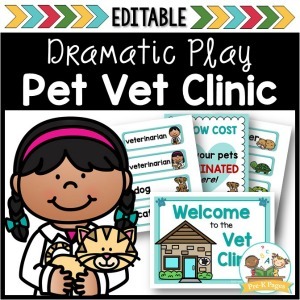 There’s even an editable template for you so you can tweak it to meet your needs! What is a Preschool Curriculum Map? 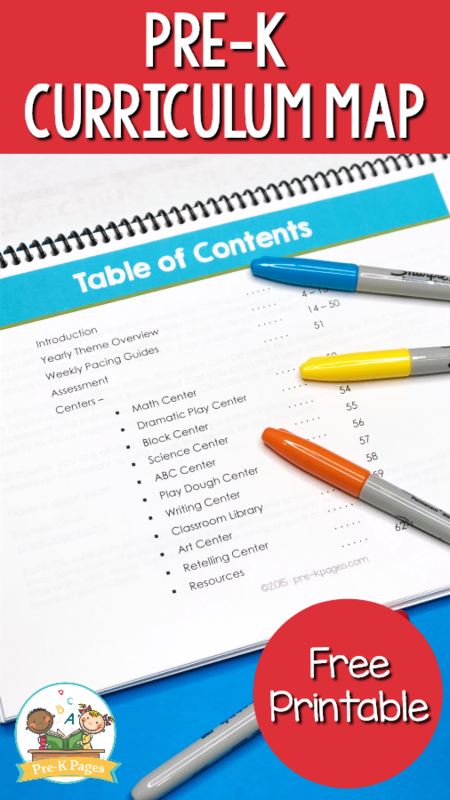 A preschool curriculum map is a framework you can reference to help guide your instruction in your Pre-K or Preschool classroom. 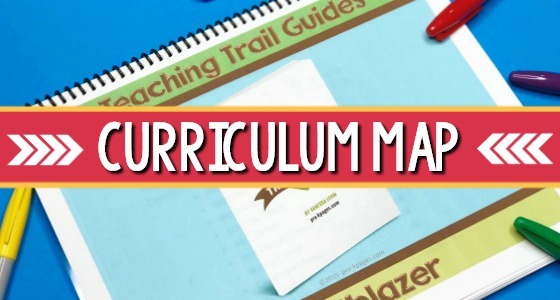 A curriculum map is also commonly referred to as a pacing guide in the educational world, as well as a scope and sequence. 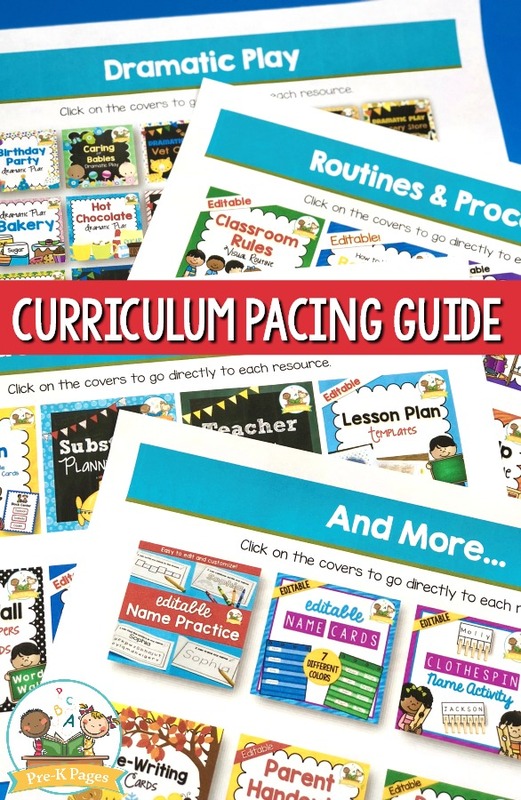 There are many benefits of using a curriculum pacing guide or map in your early childhood classroom or program. 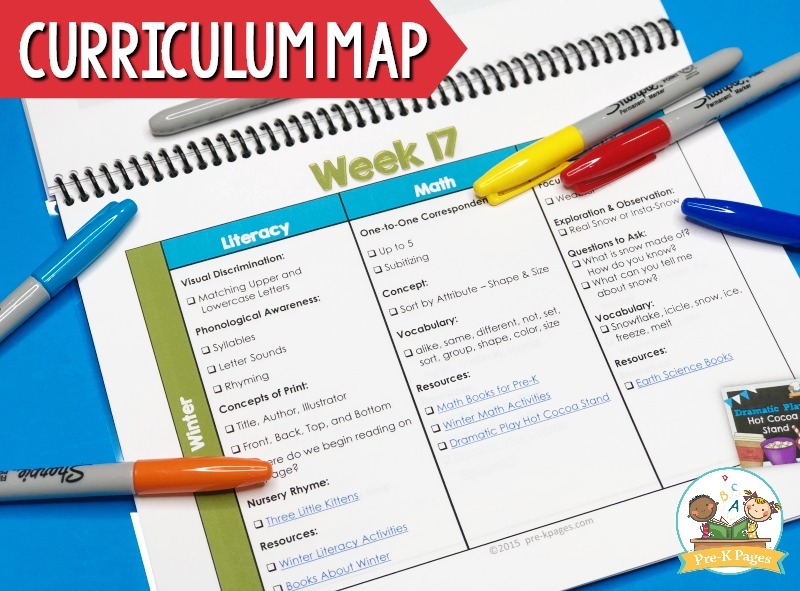 Using a curriculum map can help you organize and plan your instructional strategies for the entire school year. 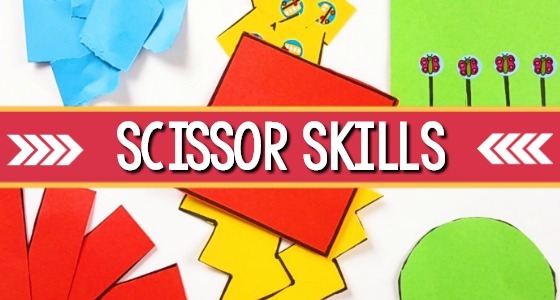 Curriculum maps can also help determine when to teach required skills so you can focus on how to best teach those skills to your students. 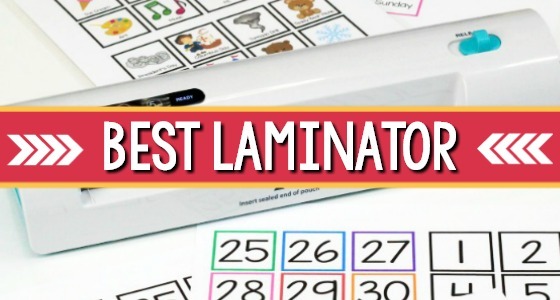 Teachers who use this resource include both public and private school teachers. 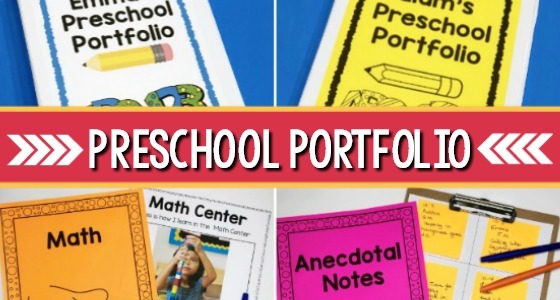 Many school districts and early childhood centers throughout the US have implemented this resource in their programs with great success. If you’ve never used a pacing guide before it helps you get a very clear picture of where you’re going with your instruction. It keeps you on track so you know not only what skills to teach, but also when to teach them and in which order. The year at a glance is just a brief outline of the topics and themes covered throughout the school year. If you notice that a particular theme isn’t currently linked or underlined that means it is forthcoming. 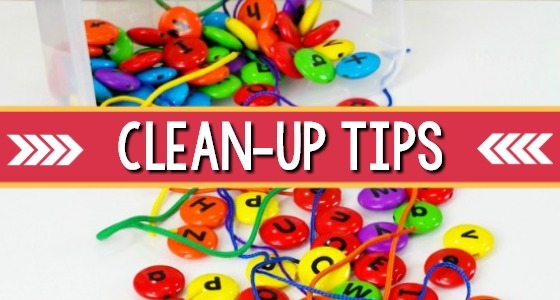 You’ll want to get on my mailing list so you’ll be the first to know when these new resources have been added. 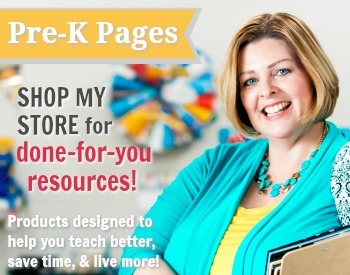 I’ll also make announcements on my Facebook Page or in my Facebook Group when new resources are ready for you. 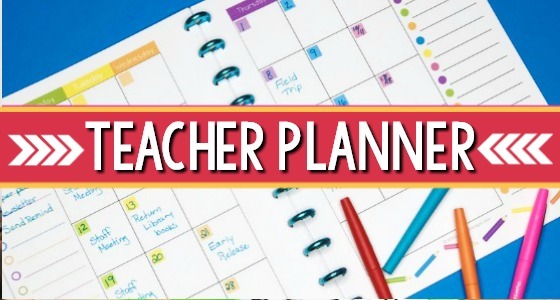 The themes listed in the document are just suggestions, feel free to spend more or less time on them according to the unique needs of your students and program. 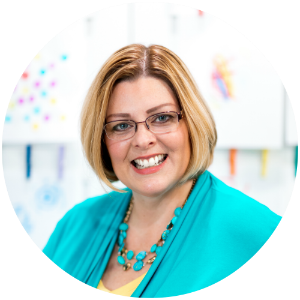 Choosing high-quality picture books is so important in the early childhood classroom. 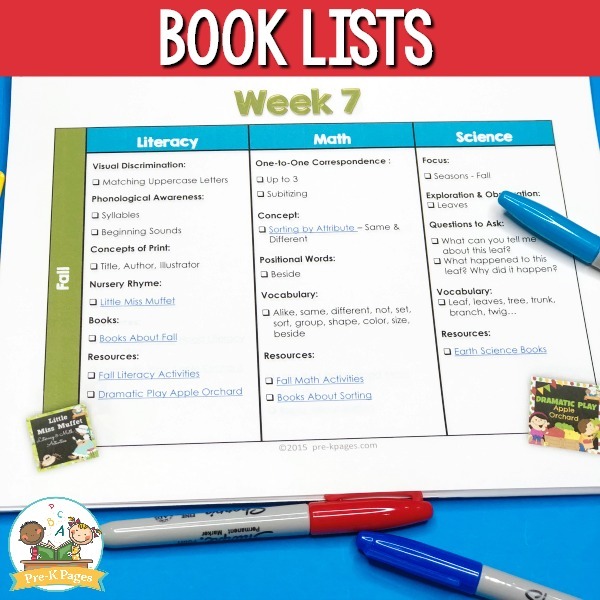 We don’t get much time with our students, so we have to make the time we do have together really count by selecting books that build academic vocabulary and background knowledge. 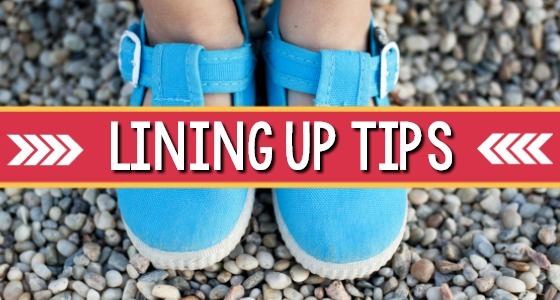 You’ll notice that there is a separate column in your guide that links to specific book lists to help you plan your lessons. When you click on the blue text in each of those spaces, you will go directly to the corresponding book list at Pre-K Pages. To start using the book lists, simply click on the current book list, and then search your local library’s database to reserve copies of the books you want. Remember, the books on these lists are just suggestions, feel free to make adjustments and substitutions as necessary. If a book list isn’t linked, that means it hasn’t been published yet, but will be soon. Which Grade Level or Age Group? 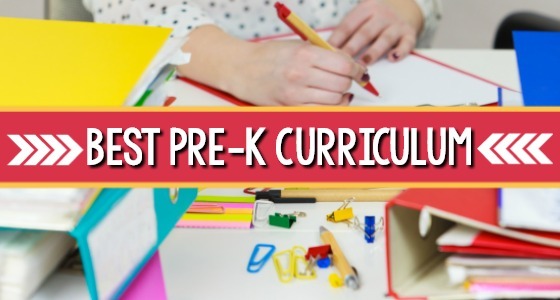 This curriculum map is specifically designed for teachers of Preschool and Pre-K, or children 4 years of age. 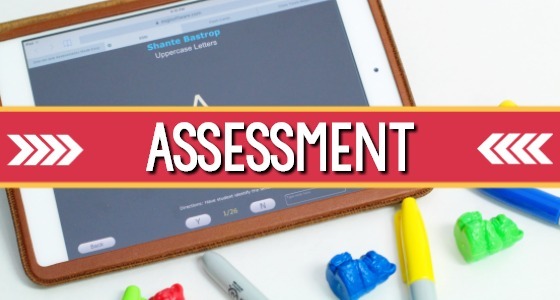 Many of the ideas and resources can be modified to meet the unique needs of students who are struggling, or those who may need more challenging material. 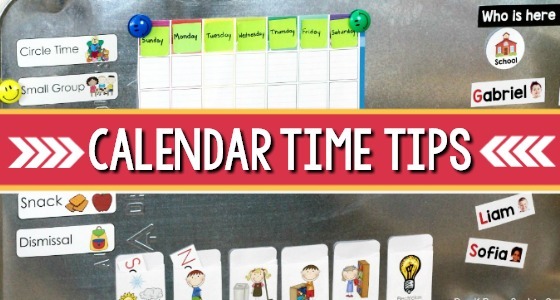 Many Kindergarten teachers also use this curriculum pacing guide as a framework, by adding more skills to support their specific required reading and math standards. 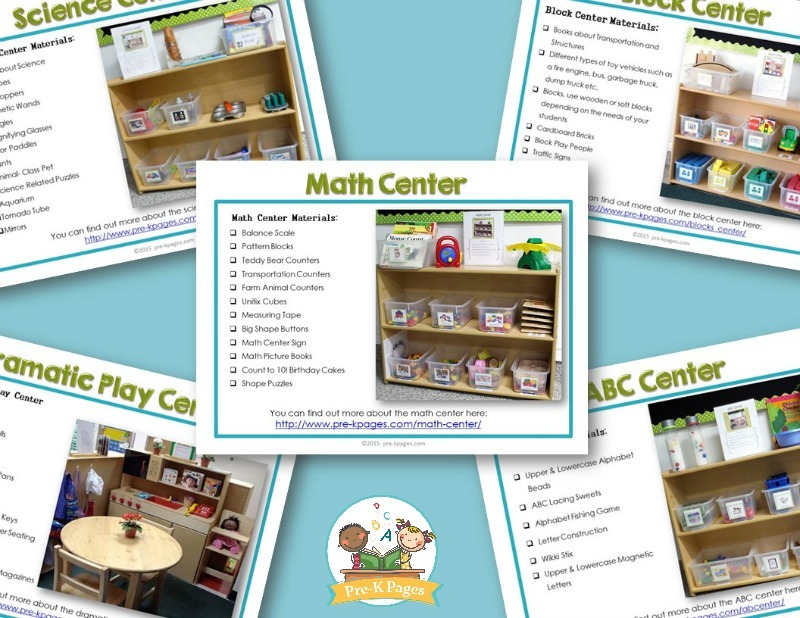 You’ll also find ten pages of classroom center pictures and material suggestions to help you set up amazing centers in your own classroom! 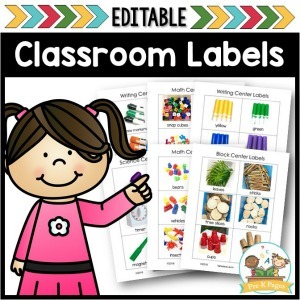 Each of these ten pages includes a full-color photo of the center in my classroom, as well as a suggested materials list plus a link to more information at Pre-K Pages. 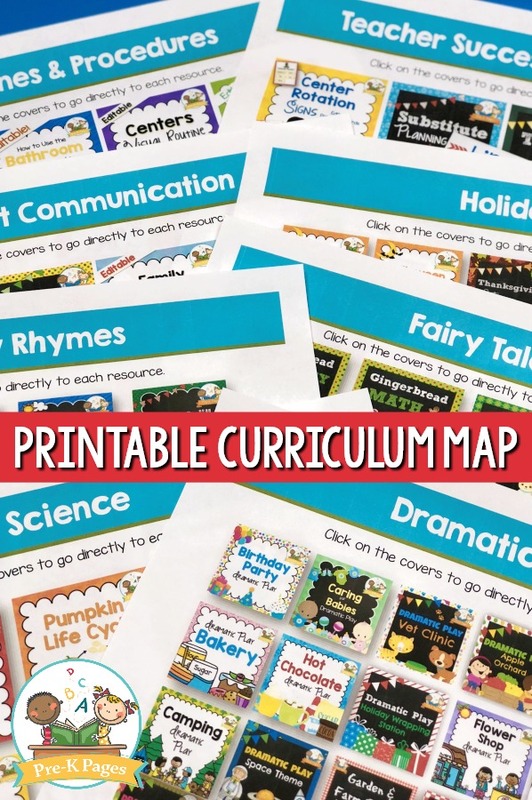 There are many ways to organize your curriculum map to meet your needs. 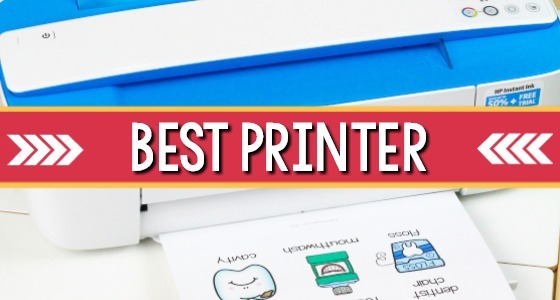 Perhaps the easiest way is to just print it out (using your Instant Ink– of course), 3-hole punch it, and place it in a 3 ring binder. You can also print the pages and have them spiral bound at your local copy store if you prefer. 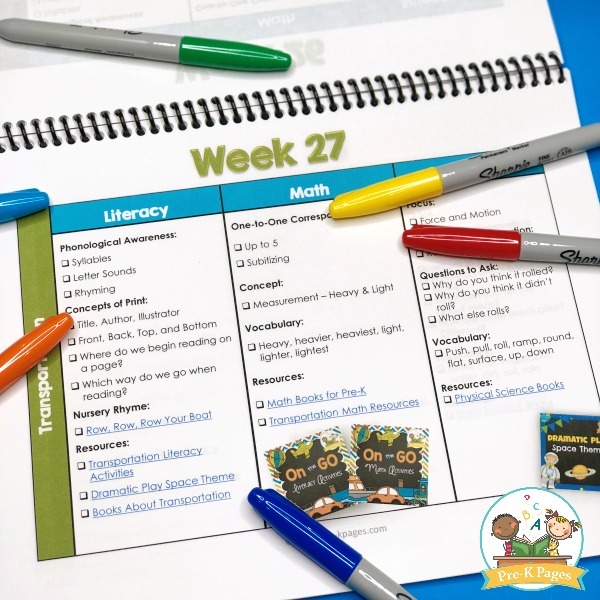 Whatever method you choose, be sure to keep your guide close by each week to help with planning your lessons. 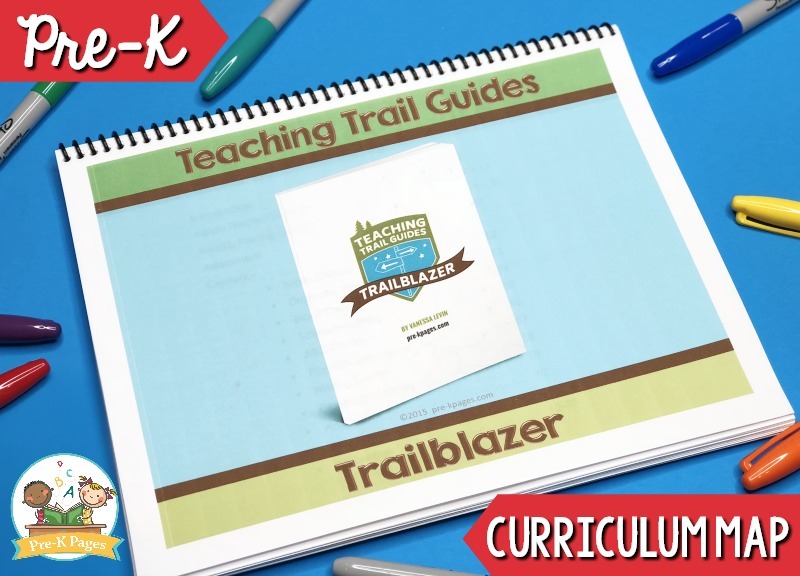 The easiest and most affordable way to purchase all of the Pre-K Pages products featured in the curriculum guide is to join the Teaching Tribe. 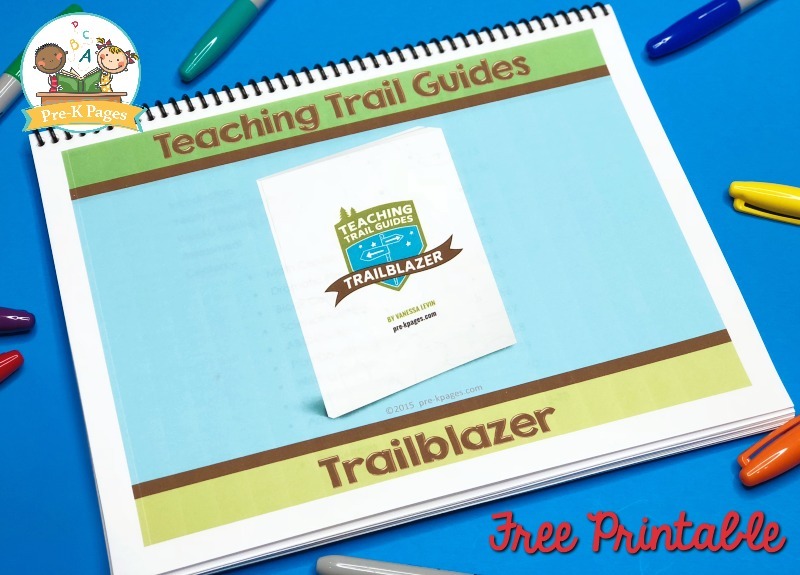 The Teaching Tribe gives members 24/7 access to all of the paid printables from Pre-K Pages, plus so much more! 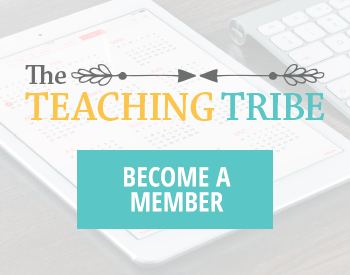 New content is added to the Teaching Tribe (and Pre-K Pages) each month.